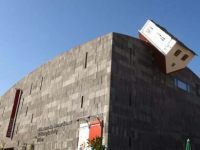 The art project, entitled House-Attack by top local sculptor Erwin Wurm, is supposed to look as if the house has fallen out of the sky and landed on the famous museum in the centre of the Austrian capital. It actually took two cranes to put the huge sculpture into place, which is complete with a red roof, window boxes and a TV antenna. So where are people supposed to live if not in a house that is “spreading like a plague across our land”? I wonder where the “artist” lives? In an old refrigerator box? And if you have to explain what your art “means” then you haven’t succeeded in your depiction.